On May 22, 2014, the Thai military took over control of the Thai government in a coup. Since then, martial law has been announced, information has been restricted, agitators, protesters, and members of the old government have been detained, and political elections have been postponed until the second half of 2015. In response, protests have broken out. While coups and protests are not unusual in Thailand (the last coup was in 2006), the form some of the protests are taking this time around is different. 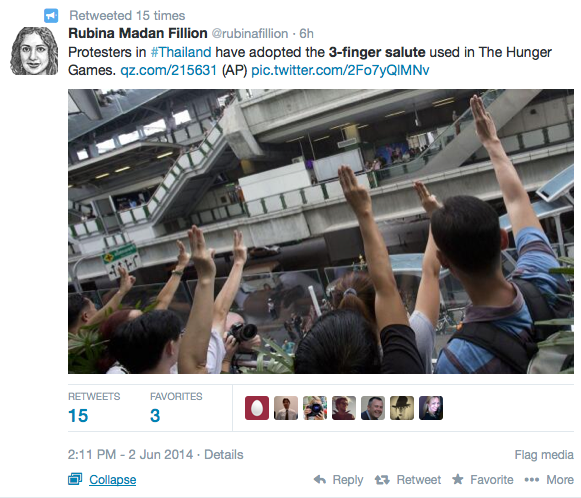 On June 2, 2014, reports began coming in that Thai protesters have been holding three fingers in the air, making the 3-finger salute depicted in Suzanne Collins’ Hunger Games trilogy. The Hunger Games has circulated widely around the world in both book and movie form. It sold more books globally than even Harry Potter and has more than 50 million copies currently in circulation. 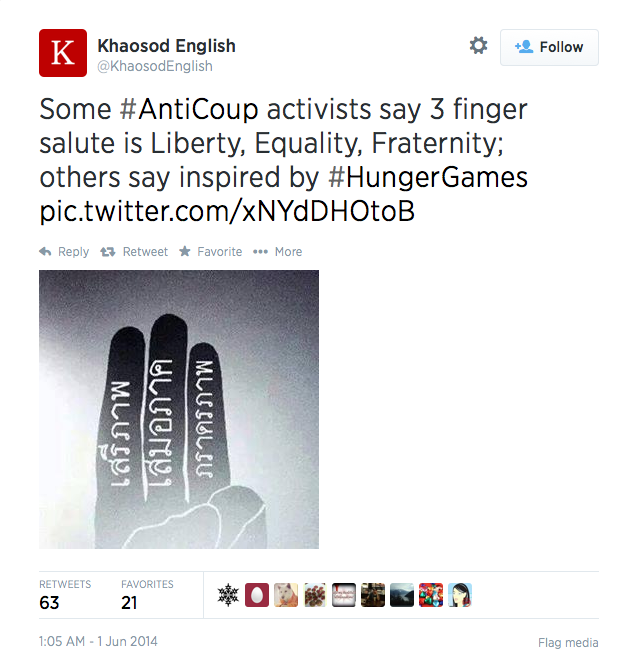 While the Thai protesters are not the first to utilize the Hunger Games 3-finger salute (see Senator Santiago and the Harry Potter Alliance), the Thai protesters have achieved widespread media attention and have brought up questions about how we are to understand the use of a symbol from a fictional book in a real world protest. I answer some of those questions here by arguing that Thai protesters using the 3-finger salute perform resistance that critiques the Thai government, even in an environment highly controlled by the state. Set in a dystopian future, The Hunger Games tells the story of sixteen year-old Katniss Everdeen. She lives in a nation called Panem in which most of the twelve districts are mired in poverty for the benefit of the Capitol, where citizens live in comfort. During the annual Hunger Games, the Capitol requires each district to offer up one boy and one girl between 12 and 18 to fight to the death. The Capitol requires this as retribution for the districts’ rebellion decades ago and uses this as a way to maintain control. Televised across Panem, the Hunger Games are designed to maximize entertainment value for residents in the Capitol while also reminding residents in the districts that they are utterly powerless. In Book 1, Katniss volunteers to take her younger sister’s place when her sister’s name is drawn for the Hunger Games. When Katniss and Peeta, the male tribute for Katniss’ district, manage to survive the games together and defy the rule that only one person may survive, they spark a kind of revolution across Panem. Books 2 and 3 follow the development of that revolution from quiet resistance to full war. The 3-finger salute serves as one of the central symbols of the revolution. Katniss giving the salute in the arena after Rue’s death in the first movie. In the trilogy, the 3-finger salute begins as a local tradition but quickly becomes a symbol of resistance. Katniss describes the 3-finger salute as “an old and rarely used gesture of our district, occasionally seen at funerals. It means thanks, it means admiration, it means good-bye to someone you love” (The Hunger Games, Book 1, pg. 24). When Katniss volunteers to take her sister’s place in the Hunger Games, the crowd refuses to clap and gives her a 3-finger salute instead. 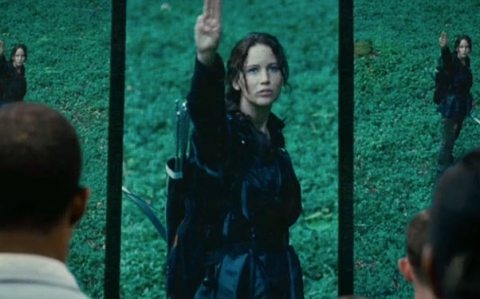 Later, Katniss uses the 3-finger salute as a form of resistance when her friend, Rue, dies in the games. Katniss yearns to show that she is “not just a pawn in their [the Capitol’s] games” but she has little power. So Katniss raises a 3-finger salute to the cameras broadcasting the games live across Panem, showing respect for Rue, while also resisting the Capitol’s devaluing of human life. The people watching the live broadcast in District 11, Rue’s home district, return the 3-finger salute to Katniss and then riot against the Capitol’s police force. Rue’s district giving Katniss the 3-finger salute during the press tour in the second movie. In Book 2, Katniss and Peeta are forced to go on a publicity tour across Panem, held up as the victors of the Hunger Games. When they arrive in Rue’s district, Katniss goes off script and speaks of Rue as brace and selfless. The people of Rue’s district respond with the 3-finger salute. The audience member who first held the 3-finger salute was publicly shot in front of the crowd as a warning against further resistance. The 3-finger salute in The Hunger Games signals respect for fellow protesters and resistance to a brutal regime. The 3-finger salute used in Thai protests functions as a form of resistance when the state-controlled environment makes that resistance particularly difficult. Brad Adams, the Asia director at Human Rights Watch, explains that in Thailand information is controlled, media is censored, and public gatherings are banned. While posters can be confiscated and lead to arrests, the 3-finger salute is both safer and perhaps more effective. This is part of what makes the 3-finger salute in the Hunger Games narrative so effective. People across the poorest districts lack the power to protest, revolt, or circulate messages of their own, but the 3-finger salute functions as a symbol or resistance even in these difficult conditions. Indeed, the Thai military and police, like the government in the Hunger Games, seem to recognize the symbolic power of the 3-finger salute. In Thailand, one person wielding the peaceful salute in public has been detained, though the military is currently determining what further course of action to take. As a symbol rich in resistance, critique, and solidarity, the 3-finger salute may pose a significant threat to the Thai military government. 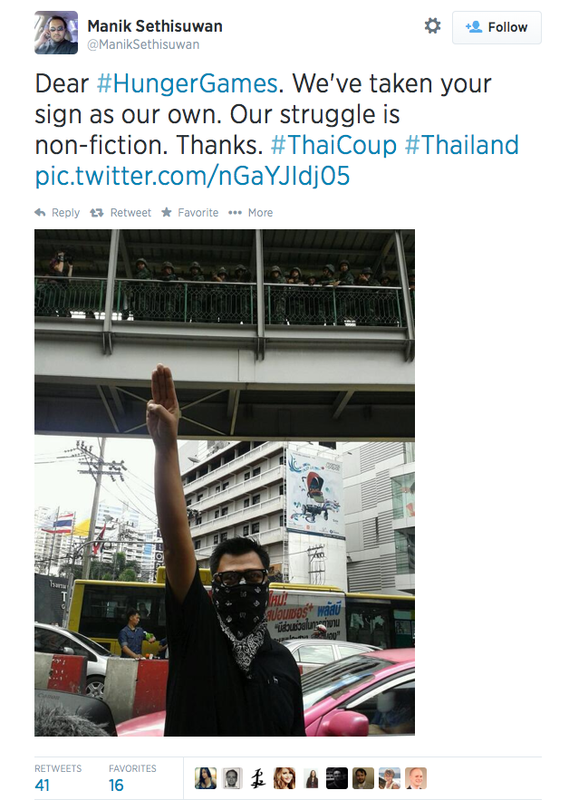 The 3-finger salute not only performs resistance, but also critiques the Thai military and government officials. When protesters hold their 3-finger salute in the air, they assume the role of Katniss and put the Thai military government in the role of Panem’s government. In this way, they frame the Thai military as corrupt, self-serving, and brutal, willing to go to any lengths to put down resistance and maintain the status quo. As Thai protesters hold up their 3-finger salutes, we are invited to see the Thai military actions as unjustified and undemocratic. Thai protesters further imbue the 3-finger salute with democratic meaning by combining it with the French slogan “liberty, equality, and fraternity.” The symbol of resistance also becomes the symbol of democracy. Between the images and tweets emerging online and the reports from journalists on the ground, we have some sense of how the 3-finger salute is currently being used. But that understanding is of course limited. There may be much more going on among protesters that we cannot see. It’s also important to remember that political and social action changes quickly, and the symbolic meaning of the 3-finger salute may change as the context shifts or new participants are brought in. The last caveat I want to offer is that I am not an expert in Thai politics or culture. I am an expert in popular culture and politics. I hope readers and journalists combine the analysis I have offered here with analysis from experts in Thai politics. With reports and editorials like this, we desperately need analysis that brings us closer to a fairer and more complex understanding of what is going on in the Thai protests. This blog post is the first step in that direction. Nice post. I look forward to more work being done as this current coup plays out. I was particularly dismayed, too, by that Guardian article you cited at the end. When the author writes, “The clenched fist of Marxist revolutionaries was not just a gesture. Behind it lay a history of revolution going back to 1789 and a huge body of serious political thought from The Eighteenth Brumaire of Louis Bonaparte to the writings of Antonio Gramsci,” does he actually think that every protestor in holding up a fist is doing so because of Bonaparte and Gramsci?!? A closed fist is a palpable social symbol that predates written history. A solemn salute is the same. To say that the closed fist builds on a long social and political history and the 3-fingered salute does not is ridiculous and short-sighted. These symbols rise up from the people, not elite political theorists! That’s what makes them powerful in social movements and resistance. This symbol just happens to come from (or, rather, via) a popular book and movie, but it is the people’s symbol all the same. It’s not in where it comes from, it’s how you use it! Right on, Casey. This is why rhetorical perspectives are critical for understanding events like this.